Whitney is a graduate of the Speech-Language Pathology Master’s program at Indiana University in Bloomington, IN. She received her Bachelor of Arts Degree from the University of Florida where she majored in Communication Sciences and Disorders. 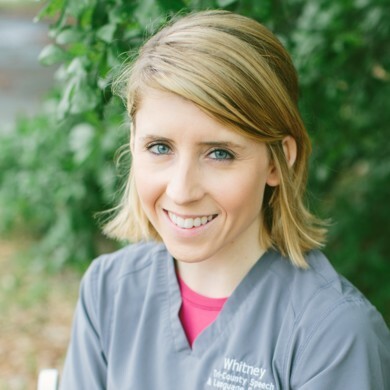 Whitney’s clinical experience includes working with the pediatric population of children with learning disabilities, autism, apraxia, cognitive impairments, oral motor impairments, visual impairments, cochlear implants, and feeding/swallowing disorders. She particularly enjoys working with Augmentative and Alternative Communication (AAC), phonological disorders, preschool language, developmental disorders, Autism Spectrum Disorders/ Pervasive Developmental Disorders, Childhood Apraxia of Speech, and school age language intervention including reading and writing. Whitney recently completed Comprehensive Orton-Gillingham training with the Institute of Multi-Sensory Education.